Dark horn with turquoise center and orange zircon bezels. Jump ring slide easily onto chain (sold separately). Ashley Pittman "Mpenzi" enhancer pendant. Polished bronze hardware. Shield-shaped light horn pendant. Vintage East African coin center. Bezel-set green jade, labradorite, blue topaz, orange zircon, and smoky quartz accents. Approx. 2.8"L x 1.8"W. Handcrafted in Kenya. 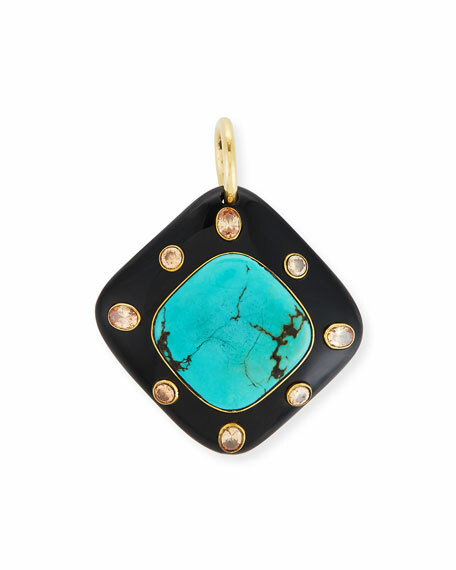 Devon Leigh adjustable round turquoise ring. Polished 18-karat yellow gold-plated brass. Round face with carved turquoise center. Adjustable, wide shank, Made in USA. Please note: As this piece is handmade, exact stones and measurements may vary slightly. EXCLUSIVELY AT NEIMAN MARCUS Jose & Maria Barrera white flower pendant necklace. Polished 24-karat yellow gold plated hardware. Floral pendant with opal-hued Austrian crystals. Tapered bale with crystal pav??. Approx. 36"L. Made in USA.